Faith and Archer head to comic-con. It's Archer's first time to be around such devoted masses of humanity, many dressed as their favorite characters and heroes. Faith is an old pro at it, a bonafide geek since the days of her youth. 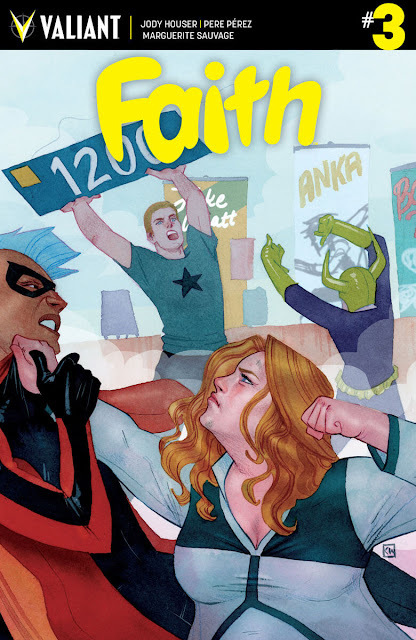 'Faith' #3 is the most lighthearted fun adventure yet but why do I feel so conflicted? It's probably the hardened cynic in me that has made me the enemy of fun. I read 'Faith' #3 and enjoyed it immensely. 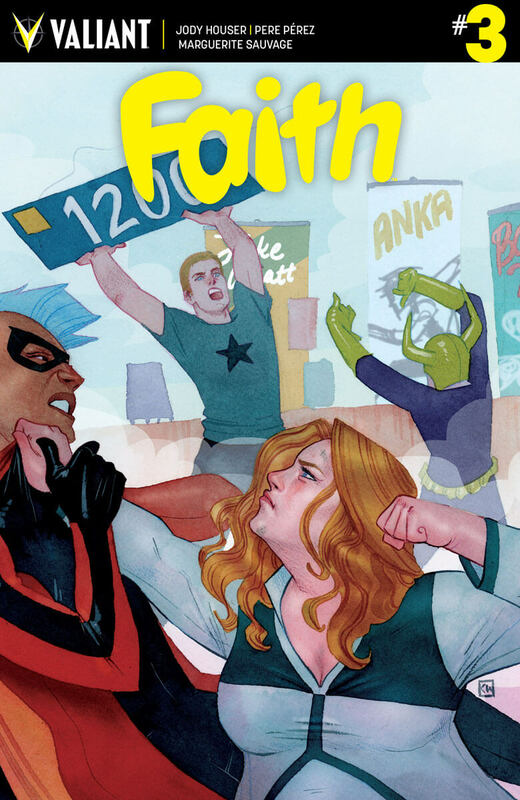 Archer's fish-out-of-water story, the neat easter eggs in Pere Perez's con coverage, Faith's helpful con tips, and Marguerite Sauvage's heartwarming con flashbacks makes this issue a love letter to pop culture cons and the people that attend them. Jody Houser throws in a Scooby Doo-style mystery for good measure. It's all a smile-inducing exercise in good old fashioned fun storytelling. Perhaps my mixed feelings stem from the fact that I'm not accustomed to my superhero comics being joyful, light, and fluffy. I shouldn't feel like something more substantial should have happened. After everything Faith has been through so far in her move to Los Angeles she should be able to get away with her beau and relax at a welcoming place like a con. She's been kidnapped by one of her favorite actors, battled a cult, dealing with a break-up, losing her anonymity with some co-workers, all while embracing her superhero duties with such enthusiasm. It shouldn't matter that Faith doesn't fight some giant omnipotent villain or advances the story arc much at all. It feels like a one-shot, a fantastic one-shot, that develops Faith's character and her endearing relationship with Archer. Perez, Sauvage, and colorist Andrew Dalhouse do such a wonderful with the art. It's bright and energetic like Faith's enthusiasm and joy stepping into the con. They hit Artist's Alley, of course, and look out for some familiar creators behind the tables. Sauvage's montage of Faith's history with cons is special all by itself, sentimental and empowering, is probably the most powerful sequence in the series. No matter how cynical the world is if 'Faith' doesn't inspire some joy in your life you're doing comics wrong. The issue is just unapologetic enjoyment. It answers the question what if your favorite superhero went to comic-con? The result is a light and fluffy good time. And there's nothing wrong with that.